Freeto Pie, cruelty free and delicious. August hailed our yearly trek half way across the country. This year the Spouse and I opted for a different route than usual. This meant finding new vegan eating opportunities. I had recently learned about The Northloop House and Yard in Austin, Texas and had to try the vegan BBQ. 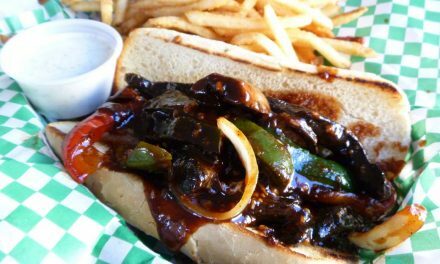 Vegan BBQ in Texas, who couldn’t pass that up? I also have a dear friend who lives in Austin, so we chose to drive the 16 plus hours from Phoenix to Austin on Interstate I-10. Quite a ride, but worth the food. You can’t go wrong in a town that boasts a high number of James Beard Award nominees and just plain good food. Fortunately, the place we stayed at was literally walking distance from my friend’s bar. Serendipity definitely worked for me on this trip. 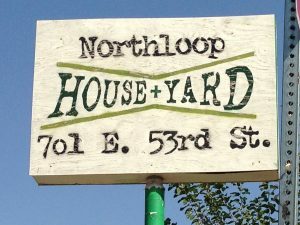 Nestled against a small suburban neighborhood bordered by busy streets exists a small, unassuming corner known as The Northloop House and Yard. Here in this small part of Austin Texas, there is the BBQ Revolution. 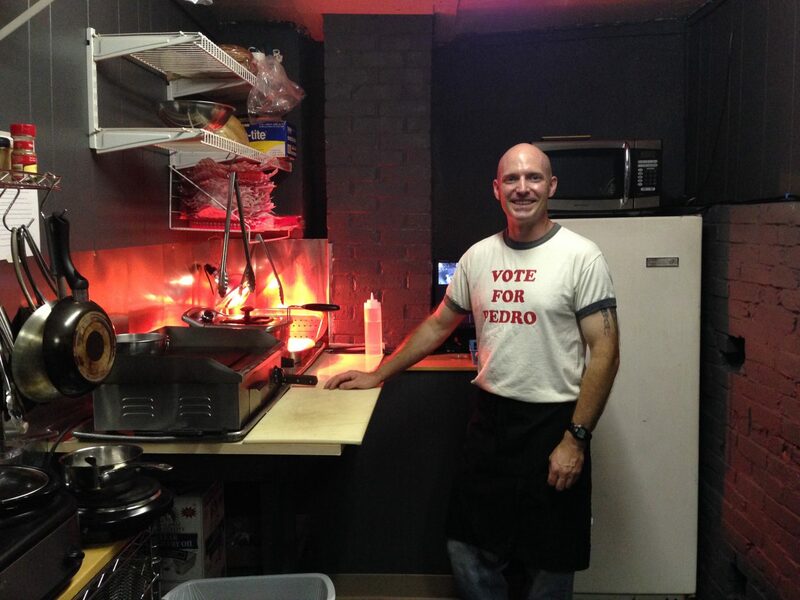 Blake Newman is a graduate of the Le Cordon Bleu Culinary program and owner of BBQ Revolution. 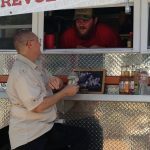 He worked in several of Austin’s high end eateries, but like most young chefs chomping at the bit to make his mark, he created his own culinary corner called BBQ Revolution. This little food truck packs a pretty big wallop. They were sold out of the No Bull Brisket, and they did not have the Garbonzo Tempeh ribs, so that left me with Smokey curls. A soy product that is smoked then sauced to BBQ chewy goodness. 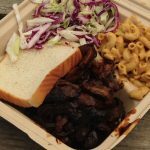 The BBQ plate comes with your choice of protein, and two sides, potato salad, ranch style beans, or mac n cheeze. I chose the Mac n Cheeze and coleslaw. I wasn’t disappointed with the BBQ. The barbeque sauce had that mixture of spicy and sweet that I love. The Spouse and I argued a bit over whether it was “good” or not, but it is a matter of taste. She is used to Kansas City BBQ, and hasn’t eaten good BBQ in over 20 years (I don’t make my own sauce-yet). Blake’s barbeque had all the essential elements I look for in barbeque. Sweet, spicy, and bitey. I like melt in your mouth barbeque, and this didn’t quite fit the bill, but it was the end of the day and I could excuse that. The mac n cheese was good, cheesy and gooey. The coleslaw was lacking something. I make mine with a lot of acidity and peppers. This was a bit on the tasteless side, but hey, when you spend all your time smoking tempeh and tofu, maybe the slaw can suffer a little. For a guy just finding his way with food in Austin, it was well worth the trip to taste Smokey Curls. I still wish I could have tried his other proteins. Maybe next time. Our next eating vegan stop was Sweet Ritual. We only found out about them because of the tattoo artist Dean at Northloop. I am very grateful. 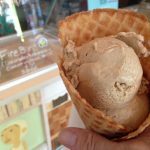 We don’t have a lot of choice for local vegan ice cream in Phoenix, so anytime I can apply my tongue to chilly, creamy flavors, I am thrilled. Sweet Ritual is a little vegan ice cream shop located inside a popular place called the Juice Stop. 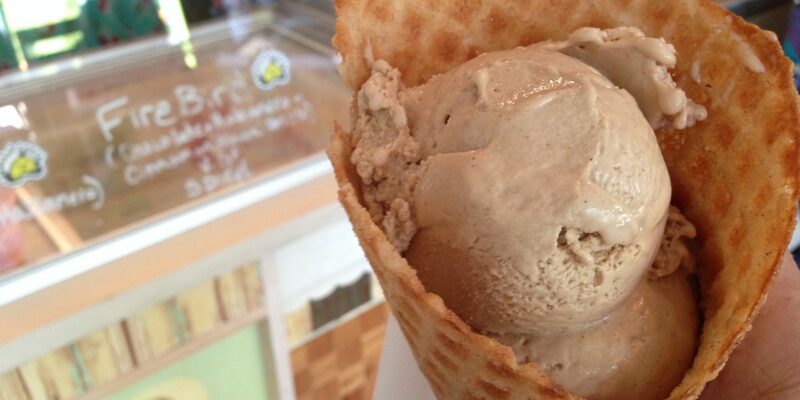 Sweet Ritual carries 16 flavors of ice cream. Impressive for a small shop. 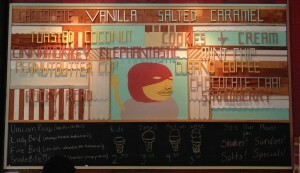 Numerous grocery stores in Austin carry their ice cream as well. 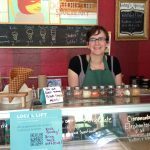 The owner Valerie Ward took time out of her busy, ice cream scooping/waffle cone making day to talk to me, and give us a tour of their production facility. Valerie was really nice, and cheerfully answered my questions. We were stared at as we walked by the juicing guys. I just stared back. As a cook, I’m used to people coming through kitchens on tours. The resort I worked at booked them on a regular basis. I have no fear! The facilities were nice. Roomy and big, with the famous ice cream making machine. It was the same one I used back in my country club cooking days, when I was responsible for making the Chef’s ice cream. We sampled many kinds of ice cream. A few of them I couldn’t have due to peanut butter and other ingredients I’m allergic to, but the Firebird was the perfect balance between habeneros and sweet ice cream. I settled on the Cubano Coffee, because, coffee! The Spouse had the Salted Caramel and the Peanut Butter Cup. The waffle cones were fabulous. Sweet, crunchy, and tasty. Definitely worth the visit to Austin by itself. If you want you can purchase the salted caramel in a honey bear bottle and take it home. Our evening stop for dinner was the Vegan Yacht. I’m telling you, chasing down this vintage Air Stream/food truck was a challenge. None of my friends mentioned that going to the area of town it was located in would be an issue. Parking on a Friday night, in a college town. Ugh. I kept my fingers crossed that the food was worth the time it took circling around looking for a parking space. I finally found one, and hooked up with the Spouse. We headed into the courtyard called the Spider House. 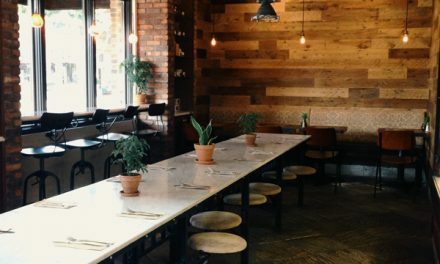 A place where there was food and drink. The Vegan Yacht was nestled all the way in the back. 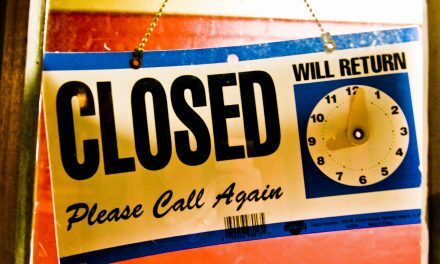 Not a bad thing, but maybe not good for us out-of-towners who really want to eat there. The other fault with this layout was that Spider House provided beverages, and being all the way in the back on a busy Friday night made us a non-priority. I had a great conversation with the owner, who told me that he got the Air Stream from a friend who actually wasn’t using it for anything. 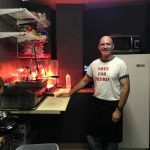 They helped him and his wife get started in the food truck business. 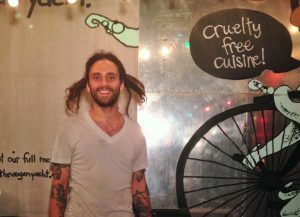 It is uniquely decorated with stickers and signs from all over, and Mike was unique himself, sporting tattoos and dreadlocks. He was laid back and personifying the Austin saying “Keep Austin Weird”. When asked about his menu, he said that he used to have a bigger one, but with one child and another on the way, his wife couldn’t help out as much. The menu is simple, but tasty. The Spouse was able to have a Freeto Pie, after years of not having one. That was a treat. 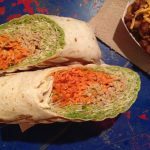 I had the Mock Wrap, seasoned tvp, sauce, carrots and sprouts wrapped up into a nice big tortilla. The food was good. Not going to say spectacular, but to have choices as vegan diners, it was tasty. And this guy is supporting his wife and kids working for himself, in an Air Stream Food Truck. For me, that’s big vegan brownie points. When you get to Austin, make sure to check these guys out. 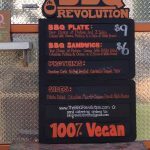 BBQ Revolution, Sweet Ritual Ice Cream, and the Vegan Yacht. You won’t be disappointed. There are several other places to eat, but we only had two days. There’s only so much food you can consume in less then 48 hours. Unity Kitchen is the other food truck at Northloop. I wanted to sample her food, but she was closed for the week, and I don’t think I could have eaten anything else that day. 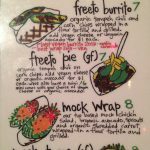 We will be planning another trip to Austin, just for the food. If you find yourself in Austin, do me one more favor: check out The Badlands, my friend’s bar. He has a cool little kitchen. It’s not vegan, but he is working on a vegetarian hotdog for us vegan diners. They also have The Romani Gallery around the Corner. They show local artists, and occasionally have events. There are rumors of a tattoo shop too. Check it out when you are in Austin. 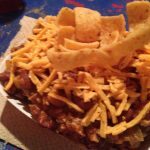 We also had eating adventures in Houston, TX; Topeka & Lawrence, KS; and a trip to our favorite restaurant in Santa Fe, NM. Check back for more culinary highlights of our road trip. 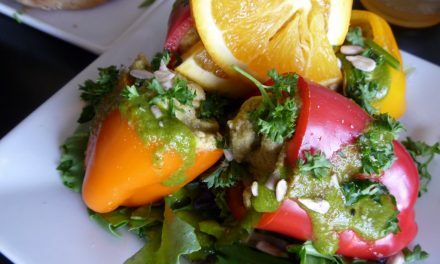 Satisfying Southwest Soul in O.C.